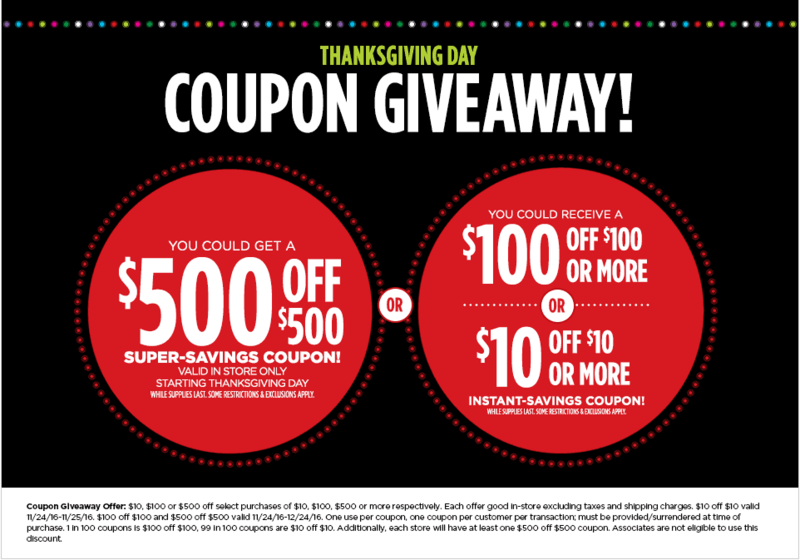 Even though JCPenney is starting its Black Friday sales online next Wednesday, the retailer is still hoping it can convince some folks that they’d rather be shopping in physical stores on Thanksgiving than spending time with loved ones/taking turkey-induced naps by offering up coupons worth $500 off to the first people to come through the doors. Hundreds of customers will have a chance to get coupons for anywhere between $10 and $500 off their purchase if they’re among the first to arrive on both of those days. It’s not that simple, however: in order to get $500 off your purchase, you’ll have to buy at least $500 worth of stuff first. The same goes for coupons for $10 and $100 off. So what are your odds of actually scoring that $500 off coupon? Probably pretty slim: JCPenney says 1 in 100 coupons will be $100 off $100, with the other 99 in 100 being $10 off $10. “Additionally, each store will have at least one $500 off $500 coupon,” the retailer notes in the fine print. JCPenney is getting an early start by opening at 3 p.m. on Thanksgiving Day, which is two hours before Macy’s and three hours before Walmart, Target, Sears, and Kohl’s are slated to open. The retailer can use as much help as it can get, after reporting plunging in its quarterly earnings report on Friday: comparable sales were expected to rise 2.7% but instead fell 0.8%. And it seems JCPenney isn’t expecting the holidays to help much, as the company revised its forecast for the fiscal year ending in January, saying it expects them now to only rise between 1% and 2%, instead of 3% to 4% it predicted previously.